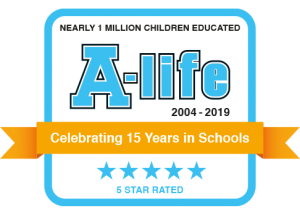 Almost 1 million children have taken part in our Healthy Workshops, Fun Fitness and Alcohol & Drugs Awareness Sessions and we would love to visit your school to help teach these vital lessons to your pupils. Our workshops are packed full of curriculum and fun! The hands-on, multi-sensory activities are accessible for all ages and abilities and have been carefully designed to meet and expand upon many objectives in the Science, PE and PSHE curriculum. With 15 years’ experience and expert coaches, we consistently receive outstanding feedback from staff and pupils alike. Our workshops provide a brilliant hook for your health topic or Healthy Schools week, with our impressive range of resources and activities that bring the curriculum to life for your pupils in a way that wouldn’t be possible in the classroom. Try us out, you won’t be disappointed!